Turkey's Attorney General has decided to lift the arrest order against the American Pastor Andrew Brunson and announced his release, Anatolia news agency reported on Friday October 12, 2018. 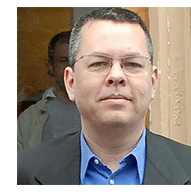 The case of Brunson is perceived as one of the current causes of tension in the relation between Turkey and the United States of America. Pastor Andrew Brunson, a 50 year old American man who has been living in Turkey for the past 23 years and ran the Resurrection Church in Izmir, Turkey. In October 2016, Brunson was arrested and later charged with terrorism over accusations of helping people who attempted a coup but failed. In July 2018, Brunson was released from prison –after spending two years behind bars– and now is subject to house arrest that may last for 35 years. The US government has expressed its disappointment with Turkey over the subject. US Secretary of State, Mike Pompeo, tweeted regarding Brunson’s release: "We welcome long overdue news that Pastor Brunson has been moved from prison to house arrest in Turkey, but it is not enough. We have seen no credible evidence against Mr. Brunson, and call on Turkish authorities to resolve his case immediately in a transparent and fair manner." US President Donald Trump also tweeted: "A total disgrace that Turkey will not release a respected U.S. Pastor, Andrew Brunson, from prison. He has been held hostage far too long. Erdogan should do something to free this wonderful Christian husband & father. He has done nothing wrong, and his family needs him!"